Kids who are too young to have the words to describe their emotions somehow have little difficulty expressing themselves. They don’t need words; they have their bodies. When you see a small child stamping her feet, there is no doubt that she is expressing frustration. When a little boy throws himself down and punches the ground with his fists, he is clearly angry. And when children spin around exuberantly, wriggling their entire bodies in sheer ecstasy, everyone around is perfectly aware of their happiness. Their joyful dance reminds me of a happy puppy. After all, puppies are perhaps the most perfect example of expressing emotion physically. What does a puppy do when it’s happy? It wags its tail so hard that its entire body follows suit. It wriggles joyfully. It prances and jumps and races back and forth. And small children do the same thing. There are different degrees of physical happiness, of course. At meal times, my daughter often performs something our family refers to as the “Happy Tummy Dance.” It involves raising her arms in the air and shrugging her shoulders alternately. A particularly exuberant Happy Tummy Dance might include wriggling back and forth in her seat as well (this is more common when dessert is involved). A scrunched up nose is also occasionally part of the choreography, as is a head bob. My son, when happy or excited, tends to perform a full-body version of the Happy Puppy Wriggle: he races around the room, pausing only to stamp his feet rhythmically, wiggle his hips, punch the air, and even spin on the floor like a break dancer. But beyond merely expressing emotion, I find that these physical expressions of happiness (and of sadness and anger, for that matter) tend to inspire that emotion. 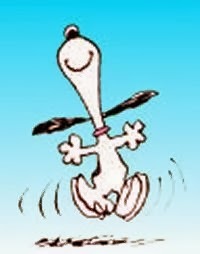 When I’m feeling a bit down and I join my kids in doing one of their happy dances, I immediately feel more cheerful. (More silly, but also more cheerful.) If I’m eating a rather boring lunch and I stop to do the Happy Tummy Dance with my kids, suddenly my lunch becomes more exciting and interesting. If my kids seem to be bored and listless, convincing them to take a few minutes to do a crazy happy dance instantly puts them in a better mood. So the next time you’re fighting off the blues, take a moment to do a little Happy Puppy Wriggle. Toss your hair, throw up some jazz hands, shake your salsa hips, tap your toes, pirouette down the hall. And if anyone gives you the fish eye, grab them and get them to join in. I bet you’ll both walk away from that encounter with a smile on your face. Although you probably won’t walk. You’ll skip. Pin This Blog or Follow Me on Pinterest!